Sept. 19, 2018 ... Farm Flavor, a national and state-specific website that focuses on topics including agribusiness, agritourism, local food, and family farms, recently published a feature on our winery Sept. 19. As our friends at Farm Flavor point out, "Award-winning Trout Springs Winery offers more than delicious wine." You can read the entire story here. August 11, 2017 ... For our remarkably successful sustainability practices, the Lake Michigan Stakeholders (LMS) and Lakeshore Natural Resource Partnership chose Trout Springs Winery as Business Champions of Conservation for 2017. The LMS environmental awards honor those who have demonstrated a commitment to environmental excellence, leadership, and accomplishment in their respective fields. 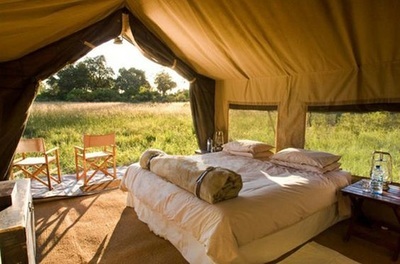 Our commitment to conservation recently reduced our carbon footprint by over 68 percent. Instead of using fossil fuels to heat and cool the winery, new geothermal technology is used for energy. Carbon sequestration is additionally achieved through land use techniques in the vineyard resulting in almost one ton of carbon dioxide being captured by the vines. In addition, we no longer uses insecticides in the vineyard; a flock of chickens are used to curtail insects naturally. Another area of conservation savings is realized in the trout-rearing part of the operations. Utilizing sequential pass-through raceways, a minimal amount of water is used to raise the maximum amount of fish, something experts in the industry said could not be done. But for over 30 years Branch River Trout Hatchery (a division of the farm) has consistently raised brook, brown, and rainbow trout, and in 2012, was recognized by the U.S. Department of Agriculture as the largest private producer of brook trout in Wisconsin. 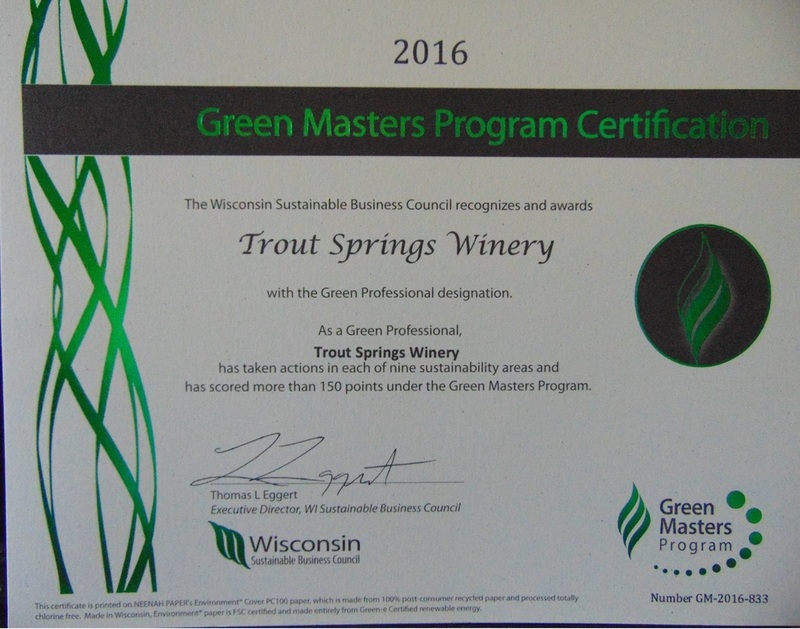 The recognition we have received recently--the creation of the Wisconsin Ledge, being named the 2014 Wisconsin Winery of the Year, receiving Green Masters Program Certification in 2015, and now being named 2017 Business Champions of Conservation--have contributed to the reputation of Trout Springs Winery as an industry leader. June 30, 2017 ... WFRV-TV Local 5 in Green Bay featured us in their weekly Road Trip segment (see it here). June 21, 2017 ... The Appleton Post-Crescent newspaper included us in their story "Wisconsin wineries to check out this summer" (read it here). April 4, 2017 ... The USA Today Network -Wisconsin recently listed our winery as one of "eight romantic Wisconsin date ideas." The newspaper column (which you can read here) had this to say: "What better drink of choice for a romantic getaway than wine? And what better wine than a local one? Trout Springs Winery is owned by husband and wife duo Steve and Andrea DeBaker and offers every variation of wine you can imagine. 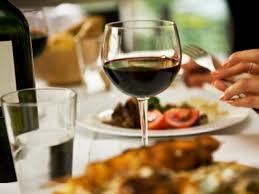 Visit the tasting room in Greenleaf as a romantic date, and order a bottle to be shipped to your address." May 5, 2016 ... It's official, we're green. For doing our part to keep our winery, vineyard, and trout hatchery as environmentally friendly a as possible, we were granted Green Masters Program Certification from the Wisconsin Sustainable Business Council. We were received the Green Professional designation, meaning we are involved in at least one action in each of the key sustainability areas: energy, climate change, water, waste management, transportation, supply chain, and community and educational outreach. TSW Makes List of "Wineries You Need to Visit"
April 27, 2016 ... The USA Today Network -Wisconsin recently listed us as one of the Wisconsin wineries you need to visit. Read the story in the Wausau Daily Herald here.